The winter truffle season is coming to a close and we’re busy finishing our DNA testing on truffles that have been sent in. Shipments of the winter truffle (Tuber melanosporum) are sometimes contaminated with inferior asiatic species. 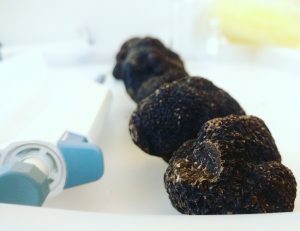 These contaminants are visually almost identical and often even checking the spores by microscope is not enough to differentiate them from the winter truffles. The problem with these other species is that they have almost no aroma, but when mixed into a batch of winter truffles they significantly increase the value of the shipment. We use our in-house PCR system to check truffles that have been purchased by chefs and members of the public as well as truffles that are destined for use in making more truffle trees. The latter is particularly important as you don’t want to wait 4-7 years to find out you’ve been cultivating the wrong species! We also regularly test mycorrhiza on tree roots with the same method, to check that the correct truffle species is growing.